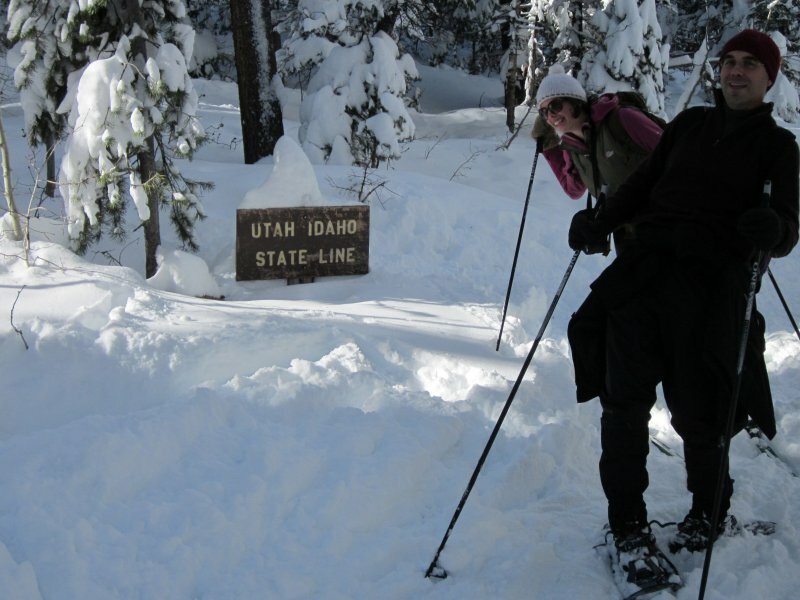 Led by Dave P., a group of 11 Cache "Hikers" traveled up Sink Hollow to the Idaho border. 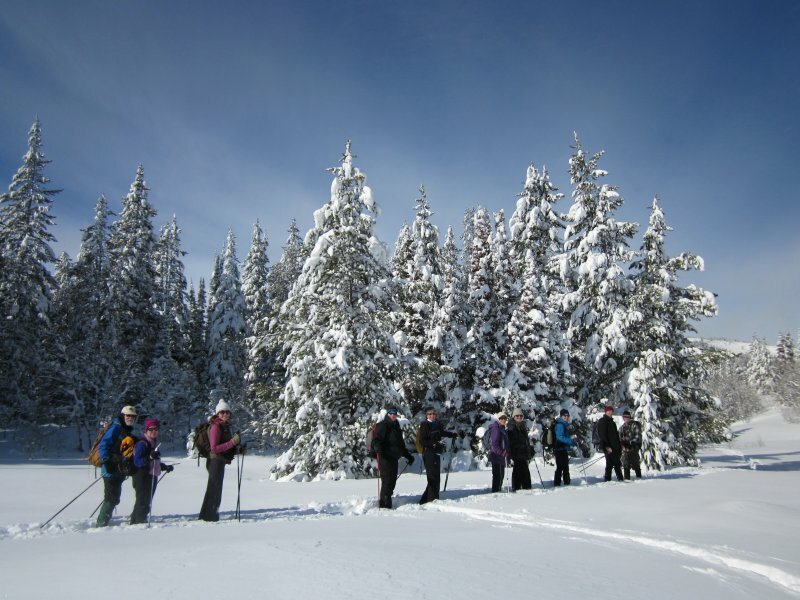 Dave P., Dave W., Jane, Christine and Alicia were on skis, while Tim, Jeanie, Kathy, Gustavo, Kyle, and Rich used snowshoes. After a disappointing snow season, the welcome storms of the past few days had dumped several feet of light powder all over the mountains. With extreme avalanche conditions on the slopes, we were happy to stay in the gentle and safe terrain of Sink Hollow, and our usual mid-morning start meant the hard work of breaking trail through the deep show had already been accomplished by others. After a couple of miles of pleasant travel, we paused to ponder the sink before moving a short distance farther to the Idaho border. We found a sunny spot for lunch, where a few of us took off our skis and immediately sank to our waists in the bottomless snow! 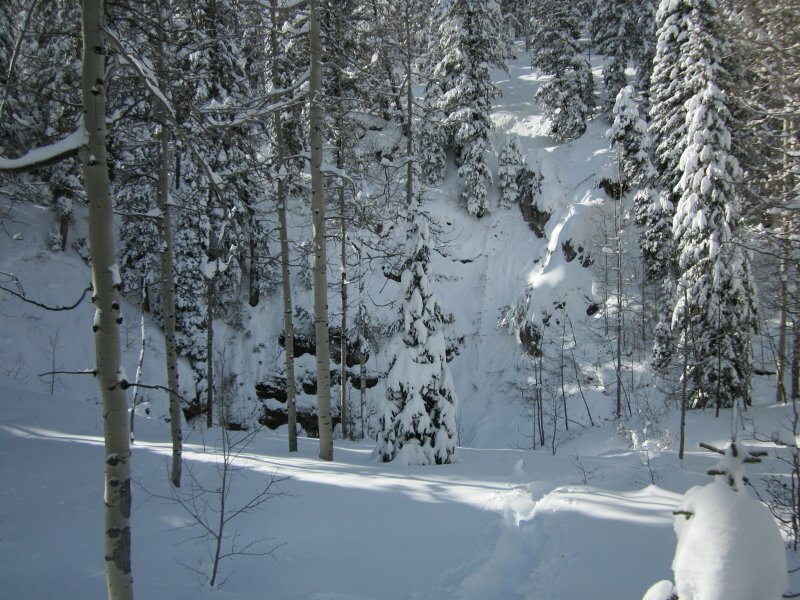 The lower layers were so weak that, even while wearing skis or snowshoes, the snow would collapse under our weight with a perceptible drop and an audible thump. The gentle slope on the way out provided an easy cruise for the skiers, but we still kept the group together. Fortunately, we had just enough people-power to push one of our cars out when we got back to the unplowed parking area. The other drivers were able to negotiate the deep snow at the Sink Hollow Winter Trailhead with their their high-clearance and 4-wheel drive vehicles. GPS data showed our total distance was over 4 miles, with about 460 feet elevation gain. This was an enjoyable trip! On the Sink Hollow trail. The "sink" - notice the avalanche tracks down on the far side. All the way to Idaho!